Two interesting and complementary boxes that cram in some real analogue fun. Lots of fun. Sonic flexibility. 100% analogue. Front panel labelling can be difficult to read. Mixer and 1/4-inch audio in/out would be useful. Station X - clearly designed to be the main part of the X/Y equation. Station Y - the 'minimodular expander'. Analogue Solutions is a UK-based company specialising in the design, manufacture and modification of analogue synths. They now have quite a formidable range of synths and drum modules, so our hearts skipped a beat when at the chance to take a peek at their new babies. Both of strictly true-analogue heritage, these twin units are intended to form a portable mini-modular sonic duo, although they can both function on their own depending on your needs and wants. "Synths such as this one are far better for creating sounds of an unpredictable nature." Both boxes come in sturdy metal cases, with a plastic carry handle on the top, although modular Eurorack (no case or PSU) versions are available. The units on review came with individual 15V AC main adaptors that plug into the back of each of the boxes. In fact, this is the only connector on the rear of the units. Everything else - knobs, patch points and switches - are all located on the front panel. The units both came with a healthy complement of 3.5mm patch cables, including a few of the splitter variety that proved to be very useful. It's hard to imagine you running out of these when sound designing. 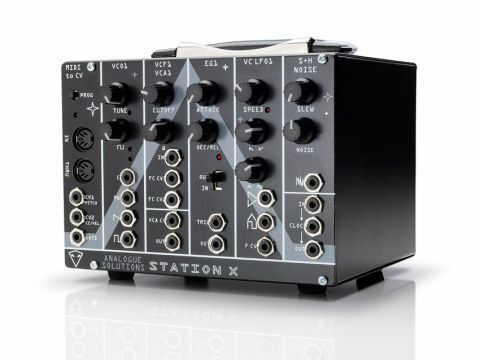 Starting with the Station X - clearly intended as the boss in this algebraic synth relationship - we find a simple self-contained MIDI controllable mono synth. Let's take a look at what the front panel has to offer - and remember that you will need to patch the various elements together yourself, there is no pre-configured routing here. First up we have the MIDI to CV section that takes a standard MIDI input and converts the digital stream into three analogue voltage outputs, with a control voltage (CV) outs for pitch and velocity (or continuous controller), and a simple note on/off Gate. Next comes the single VCO (Voltage Controlled Oscillator) with saw and square waveform outputs and CV inputs for pitch and Pulse Wave Modulation (PWM). The VCF is a 24dB/oct low-pass 'Moog' style filter, with cutoff and resonance (Q) controls and two cutoff level CV inputs. Below this is a simple VCA (Voltage Controlled Attenuator) section for modulated level control duties, which is hard-wired from the filter section's output. The LFO section has a knob for modulation speed, and individual controls for the variable phase sawtooth output (when this knob is pulled out the waveform is inverted), and combined triangle/square wave output (pulling the knob switches waveform shape). The LFO frequency can be modulated via the F CV input. The synth is rounded-off with a Noise generator and a Sample and Hold circuit consisting of In, Out and Clock jacks. The Slew control adjusts the glide time of the S+H CV out. Now we come to the Station Y, subtitled a 'minimodular expander'. On offer here are two VCOs and EG with similar features to that on the X. An LFO is also provided that has a global speed control and two independent level controls for the triangle and square wave generators. The triangle output is provided on two outputs for additional routing flexibility. Next, the Mixer section, with six input jacks (for audio or CV, but not both simultaneously), and both normal and inverted phase outputs. The splitter section does what it says with two four-way splitter connections. Finally comes the Ring Modulator (especially good for metallic tones) with two ins and one modulated out. Both the X and Y, with their fully modular design, make it possible to connect to other pieces of kit in varied and interesting ways. The X would make an ideal partner to a non-MIDI CV/Gate equipped synth, while the Y is perhaps better suited to expanding an existing sequencer controlled setup. Remember that you can patch audio in and out of these units in lots of different places, making it very easy to add ring modulation, filter, tremolo and amplitude modulation effects to external audio. Analogue Solutions will soon be introducing the 'Station Q', an eight-step sequencer (three CV channels, and two Gate channels) that should allow for some interesting programmed synth lines, but most CV/Gate sequencers should do the trick for you. All this spec detail is fine, but what about the units in use? The first thing we should mention is that we had a lot of fun, and managed to conjure some interesting sounds, whether of the planned or 'creative mistake' variety. Synths such as this one are far better for creating sounds of an unpredictable nature than the average soft synth, and can be messy with all the patch leads flying around, but this only adds to the hands-on fun. Don't forget that you can also route external sources into them. The biggest problem we had was with the knob legending, making it difficult to see what was written unless the units were mounted at eye-level. With boxes this size space is clearly at a premium, but an additional mixer would also have been welcome, as would some form of high-pass filter, perhaps in the RM or Splitter sections of the 'Y' - and perhaps a power indicator. Our top request though would be for a rear panel 1/4-inch jack input and output routed to the front panel of the 'X', which would make hooking-up to other gear much easier. Overall, although not cheap, both of these units do offer some serious self-contained analogue pleasure, either by themselves or to expand an existing setup.